Nobody put a gun to my head to do this. A couple weeks ago, I signed up for a challenge with some friends and family. It’s called the Whole Life Challenge; it runs for 8 weeks and the Fall challenge started last September 13. It’s not exactly a diet, it focuses more on making better lifestyle choices that participants could adapt to even after WLC ends. I saw a friend who participated in the previous challenge and she had kept the weight off even months after, so I thought why not give it a try? It’s seems like a good idea to lose some extra pounds and gain a new experience. To be honest, I was hesitant to share this with our dear readers because I wouldn’t want to ever sound preachy about eating well or exercising daily. What I want to share in the weeks to come is that good food is everywhere, and making better food choices need not be boring. I almost burst into tears when soy sauce came up on the non-compliant condiments list. How can an Asian person live without it? Commercial soy sauce contains wheat, a no-no ingredient in WLC. 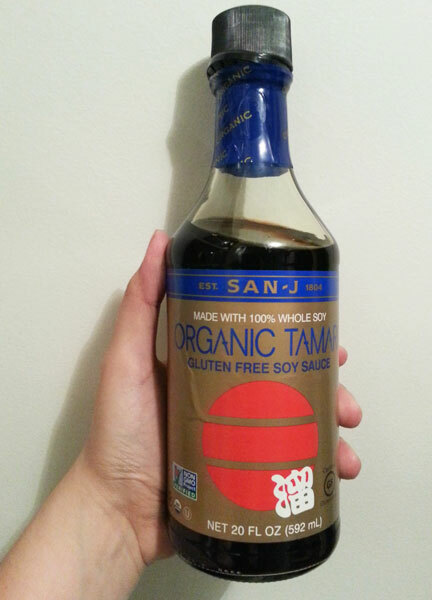 Tamari is another type of soy sauce and a by-product of miso and wheat-free. I tried it alone, it’s less salty but the umami is more complex. I’m looking forward to using this in the kitchen and I’ll be carrying a small bottle with me for dining out. If there are previous WLC participants reading this, do share your experiences! Others who have done any serious lifestyles changes are welcome to share, too. Hi, where do you get your organic tamari? How is it compared to liquid aminos? Thanks. Hi C! I got my tamari from Healthy Options. I honestly have not tried Liquid Aminos yet but I heard from friends that it's a good sub for soy sauce. Thanks for stopping by! Hey Drea, thanks for stopping by, do share your experiences with us here!